A while ago, a friend informed me of the amazing macarons at Bouchon Bakery, as she is a bit of a macaron fiend (hi, Joyce :)). I've been meaning to go there ever since but have failed to catch their open hours every time I'm in the Time Warner Center. Word on the street is that they are opening a Bouchon in Rockefeller Center but not until March or April of next year. 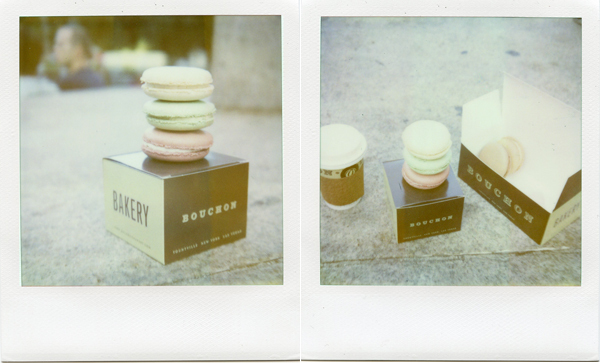 The obligatory polaroid-macaron shots. Although I love the faded vintagey colors of this pack of film, I do wish it showed the colors of the macarons better. Strawberry, pistachio, vanilla, chocolate, and coffee. Devoured all of them on the steps of Columbus Circle (I had help, ok?). I used to crave chocolate chip cookies...now it's all about the macarons. Happy for you. Sated, or just teased? Wow, I love your Polaroids. I'm still breaking in mine so the results aren't so great. Super yummy... I think I like caramel the best! oh but the raspberry follows close behind. I've heard of this bakery, there's one in Napa. I'm on a huge Macaroon's kick lately. I'll have to check this out someday soon!